According to what we heard couple of weeks ago, Nokia might be planning on launching up to 7 smartphones this year alone. The company has already started with the Nokia 6 which was released few weeks ago and it's doing pretty well with over 1.4million registration at the moment. Although the Nokia 6 is a middle range smartphone, it's rumoured that Nokia is currently working on a high Snapdragon 835-based smartphone which will be called the Nokia P1. But aside that, another low-end smartphone might also be released with the name Nokia heart. The Nokia heart is expected to run on android Nougat just like the Nokia 6. 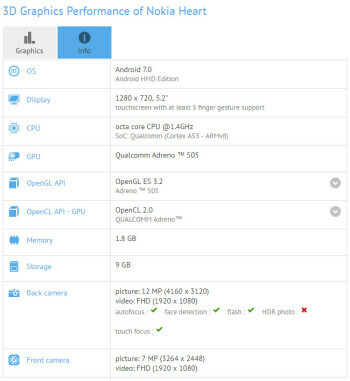 It's also going to be powered by the Qualcomm Snapdragon 430 octa-core processor under the hood. Unlike the Nokia 6, the upcoming Nokia heart will feature a much smaller 5.2-inch display with a 720p resolution. In terms of memory, it's expected to come with a 2GB RAM and a 16GB ROM. The device will also feature a 12mp rear camera and a 7mp front facing camera, although the real digits is expected to be 13mp and 8mp respectively. Although there hasn't been an official statement yet from Nokia, so I guess we all just have to wait till next month, which is February when Nokia will announce their next generation android smartphone at the WMC 2017.